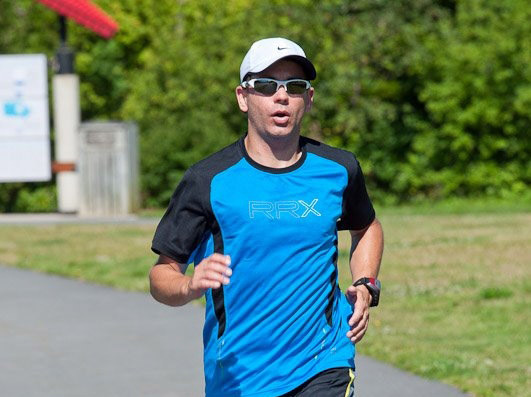 One of the first things Jason Kaulbach did when he moved to Saint John was get involved in Emera Marathon by the Sea. He’s been involved ever since. This is the 11th story in a series previewing the 2015 Emera Marathon by the Sea. There is a perception among non-runners that running is agony. And even those first steps for many runners are not associated with bliss. Jason Kaulback was one of those who was initially skeptical. But unlike those who give up, he kept at it and over time become fully converted to running in his Nova Scotia home town, posting impressive results in events he took part in at various distances. Now a resident of Saint John, Jason is an example of the lengths one can go, thanks in large part to his participation in the Emera Marathon by the Sea. Last year, he completed the full marathon and he is returning again this summer. Here is his Running Whys Story. “Try running”, they said, “You’ll love it”.